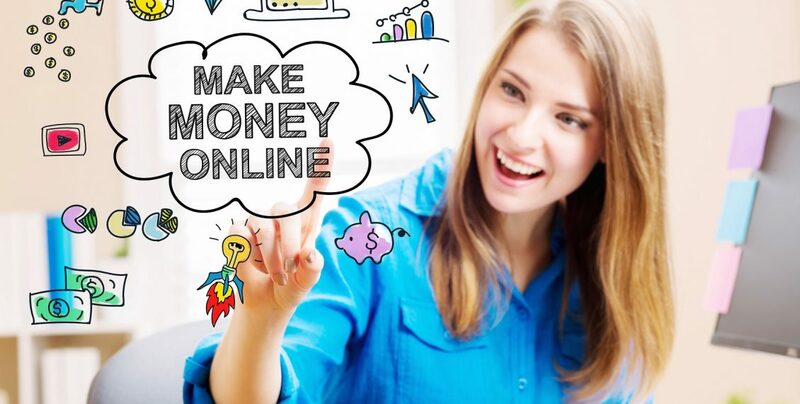 Online Business – DIME Consultants Inc. Most people are pretty sure they’re savvy when it comes to phishing scams… but often they still fall for scams, or are at the very least, targeted very specifically. Here are several very important reminders for everyone – even when you think it’s harmless, it can be used against you! I posted this earlier today on my Facebook wall, and I encourage you to share this as much as you can. It’s too easy to forget! This is a must share reminder. – Do NOT post information that you would not be comfortable sharing with a stranger or seeing it in the newspaper. – Be careful about sharing too much information about yourself. An attacker could leverage anything that you share. ** This especially applies to those types of “share this” and 20 question type posts that are like chains – “what was your first car”? “What is your favorite vacation”? “Where did you grow up?” “what school did you attend”? All of these are typically security questions on some banking and other sites. If you then start sharing this information with the world, all of this is a major security thing. Unless you’re answering jokes, don’t post legitimate information. – Be careful about who you accept as a friend on social media!! If you DON’T know the person, check out their profile. (Hint: if they’re “widowed” and have pictures in an army type suit or a father / daughter” type picture, these are usually fake profiles.) If they have no pictures or their account has no posts except something in the past week or so, it’s also likely fake. Hit the DENY and REPORT SPAM button. – If a family member or friend suddenly asks you to friend them (and you’re already friends)… contact them privately OUTSIDE of social media but to the ORIGINAL person to ask if they in fact did create a new account. Most instances the answer is NO and someone has replicated all of their information, stole their pictures etc. to try to scam you by thinking it’s a legitimate family member or friend. Report the scam profile. – Don’t make your entire social media profile publically accessible. Check your security! Remember, when you receive an email, even if you know the sender – (but especially if not) – be suspicious of links, attachments and poor grammar. If they say “check this out” and it contains a weird link- DON’T fall for it. – Always hover over links to make sure that it goes where the text says it will. While the text of the link may look legitimate, the actual URL for the link may not. If unsure, move it to your junk folder (particularly in outlook) and you can see what the original link is. – Your banks will NOT send you emails to verify your account, or under sudden investigations etc – unless you’ve literally JUST opened an account (within a few minutes) AND are EXPECTING that email. – Only open attachments from someone who is a trusted sender, and you know you were expecting it. (If unsure, message them to ask). – If you have outlook or some “mail preview” option – consider turning it off. Yes, it’s one more step to view the email, but it helps ensure viruses can’t be triggered on open. (NOTE this is a tip to also send to your junk folder – which prevents attachments from triggering). – Poor or incorrect grammar, spelling mistakes, unusual urgency, or messaging that is uncharacteristic of the sender is a sign the email is probably a phishing scam. Please share or copy/paste to your timeline. It’s important that everyone is reminded – no matter how safe we all think we are, many forget these things and post far too much information publicly. Earlier this week I came across a post in my newsfeed on Facebook that felt momentarily like the post of the year winner to me. Because it brings out a point that many of us have been feeling, but no one was really saying. 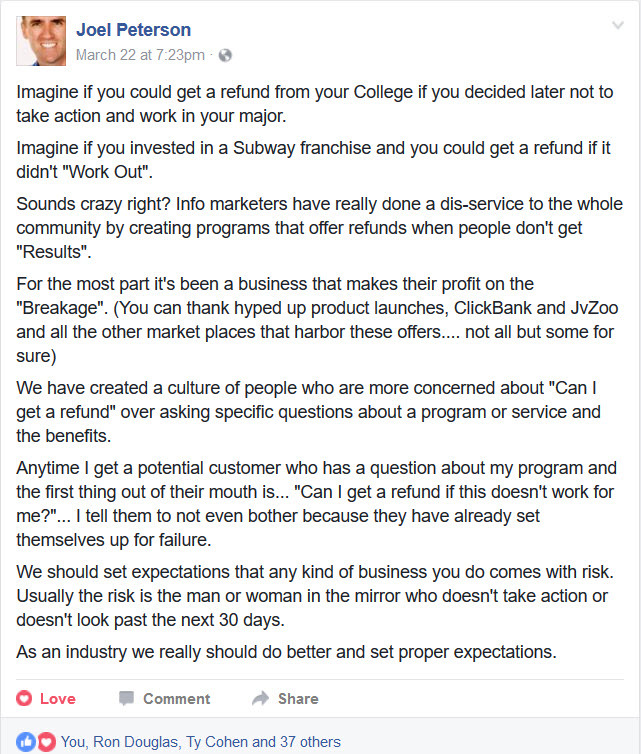 Yes, it is about refunds, but actually it’s more regarding a mental shift that is seriously needed in this industry. So before I remark any further, let me share Joel’s post with you. I wanted to do a “happy dance” when I read this because he is absolutely correct. It’s too easy to jump from shiny object to shiny object, and never see success because you aren’t sticking with it long enough. Contrary to what seems to be the hype in IM, normally you CAN NOT get rich overnight. You can’t even always make a lot of money “overnight”. In order to do that takes a LOT of effort, prepwork, and ACTION. It’s easy for a marketer to say “I slapped this up and made $xxxx in minutes”… but they fail to usually reveal HOW much time it took them UP TO THAT POINT to earn that money.You can’t take a person who has no knowledge or understanding of any of it, AND with no money to start with – and expect them to make even a few hundred dollars in under 24 hours WITHOUT a proper foundation or training. And if on the rare chance it happens once…. the odds of that happening twice are not very good.I’ve seen this far too many times and it’s frustrating.YES, many of us can send a mailing and earn in a short period of time. Does it happen “every time”? No of course not. Sometimes things just flop. Other times, it goes crazier than you ever expected. But there is definitely time and experience in these factors. People see “refund” and they come along and decide the next shiny object deserves their money more, even though they never even attempted to make it work. I think it’s important that a refund option should typically have some requirements along with them, such as there requirement for the person to actually take action and PROVE that they have to bring some value back to the industry. It’s important to switch the “dollar store me mentality”, help people STOP jumping from product to product, and actually implement. I’ve had many admit to me that they get too distracted too easily. But then don’t blame the product and ask for a refund because you didn’t actually take the time to fully test it and get through ALL of it. And even still, if you’ve bought a course or something, and you DO get through 100% of it (rare that everyone does) – I’m sure you still learned SOMETHING you could use in future. Sometimes you already “know” it, but perhaps it’s said a different way that sticks in your mind. There have been tons of products I’ve bought that even when finished, weren’t that great. But I’ve never asked for a refund on them, because I would never want to get that sort of Mentality. If I go and buy say a hand crafted food item from a store… and I don’t like it – am I going to try to take it back because it didn’t taste the way I thought it would? Of course not! If I go to Chapters and buy a book – did you know that they actually DON’T usually like to refund a book?? I had that happen ONCE. The book we bought had a lot of offensive material we didn’t know was in there, it was complete garbage, and I took it back. They didn’t want to refund me – because their answer was, books are non-refundable. It wasn’t their fault I was offended by it. (Which is true). My husband went to college for programming… but no matter how good he was at it (and amazing at troubleshooting), he kept getting jobs in Networking instead. Does that mean he has the right to go to the college and say he wanted a refund on his training because he didn’t end up getting any job in programming?? Another associate posted this morning that a person actually asked for a refund because he wanted to change the affiliate he bought through to get a better bonus. Really?? He’ll get refunded… and very likely blocked from ever buying again. The industry as a whole gets a bad name. So let’s clean up the mentality surrounding marketing online, and infoproducts. Stop offering frivolous refunds for no reason. Make people realize in order to GET a refund, they must do this, this and this. This WILL help stop the “shiny object syndrome” and the serial refunders. This might help bring a lot more value back as well, because affiliates and JV partners will absolutely be much more likely to properly vet a product and make sure it’s good before the promote it and put their name to it as a referrer.